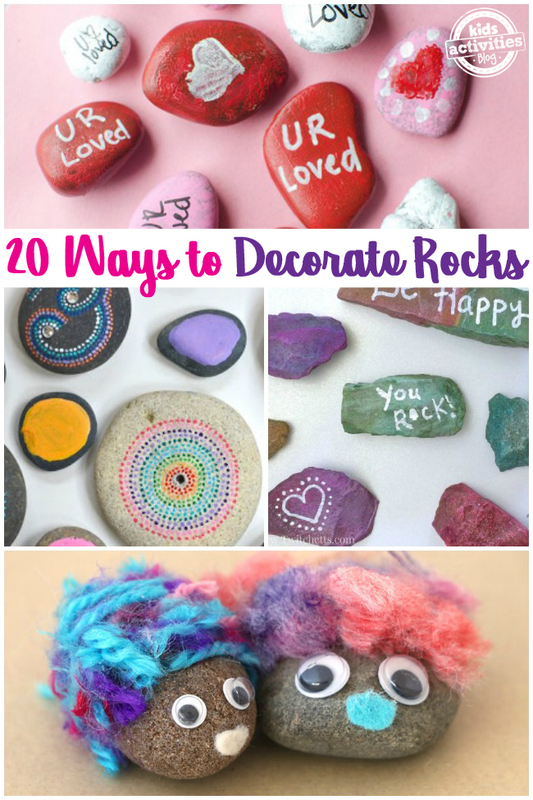 These rock decorating ideas will inspire you (and your kids!) to join in on the kindness rock craze. There are so many different ways to paint rocks, and we’ve found some of the best! Collecting and painting rocks is a classic activity for kids and one that gets our kids playing outside, enjoying nature, and nurturing creativity. But there are so many more ways for kids (and adults!) to decorate rocks in addition to painting! Yarn, felt, googly eyes, markers, melted crayons, and even borax solutions can all make fun and creative ways to decorate rocks. Whether you’re looking to create a series of kindness rocks, treasured kid-made keepsakes, or if you’re in it just for the crafty fun, here are Crazy Fun Rock Decorating Ideas for Kids! Melted Crayon Rocks – We love how simple and colorful this project is. Rock Monsters – Kids will have fun creating monsters like these. 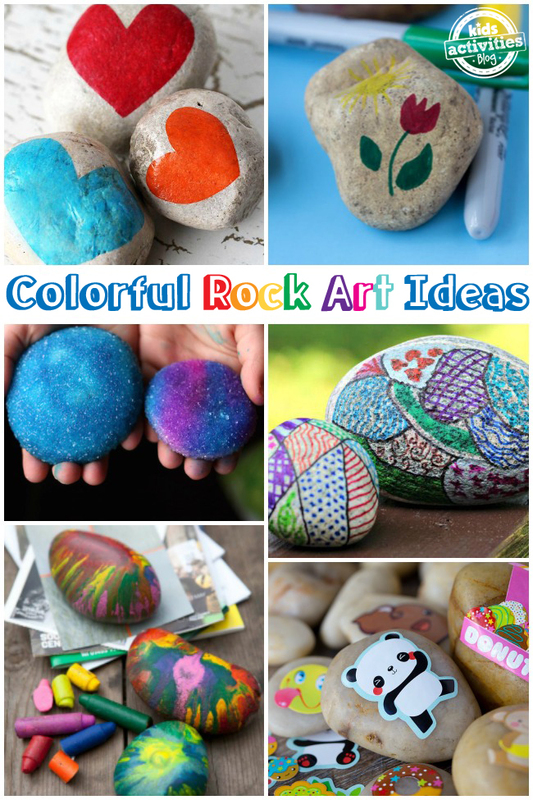 Easy Sharpie Rock Art – Use markers to color rocks instead of paint! Heart Stones – Paint encouraging messages onto stones and leave them for others to find. Painted Rock Sharks by Sustain My Craft Habit – We love this idea for Shark Week! Painted Rock People by Non Toy Gifts – The kids made one of these for each member of the family for Christmas one year. Zentangle Rocks by KC Edventures – Creating zentangles is so relaxing! Bug Village by Crafts by Amanda – This bug village is seriously adorable. Rock Chalk Faces by Club Chica Circle – These made our neighbors laugh when they saw them! Just be careful not to leave the rocks in the middle of the sidewalk! Painted Stone Fish Craft by Messy Little Monster – We turned rocks from our beach vacation into these. Space Rocks by You Clever Monkey – These were perfect when we were studying the eclipse and doing this STEM Solar System craft. Melted Crayon Rocks by Red Ted Art – This is a great way to “recycle” old crayon pieces! Crystalized Rocks by Happy Hooligans – We decorated these at Easter to look like eggs! Fluffy Pet Rocks by the Craft Train – My daughter’s teacher had the kids create pet rocks like this for a lesson and the kids loved them! Sparkly Painted Rocks by Craftulate – Sparkles make any craft project better! Site Word Pebbles by the Imagination Tree – Practicing sight words was never so much fun! Sticker Rocks by Fireflies and Mud Pies – Don’t want to break out the paint? Try these instead! Dye Decorated Rocks by Twitchetts – These are really subtle, but so pretty! Magic Dragon Painted Rocks by Color Made Happy – Make some of the most exciting play accessories with these rocks! Gratitude Stones by Fireflies and Mudpies – These are simple, but so beautiful! Now that you are done decorating, why not play some games and activities with rocks? Make sure to visit our Facebook page to share photos of the rocks you make!